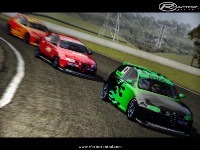 Alfa 147 Challenge, original bei Team RSDG for F1 Challenge. I was pissed about the A-modders team taking so long on their conversion of the alfa 147 cup. So i started today converting the mod by myself. The A-modders version will be a lot better than mine, but it´s good enough to fill the hole. So don´t be mad about my version, i did it in only 6 hours. I changed a lot of stuff, and the car got a new engine and a lot of bump and spec maps. Also i added 4 new fantasy cars. I will change the steeringwheel in the next version, the actual one is a bit to large to corect it 100%. Also i will rework the physic´s again and change a lot of things. The next version will be the only update. I did my best to convert it, but i´m a beginner and i got not much experience and time. When the a-modders team releasing their version so i will be remove this one. But i hope it´s good enough for some little races, have fun with this. There are currently no setups for Alfa 147 Challenge. Add a Setup. para todo aquel que necesite el fix para los espejos que tienen ZOOM, solo pidamelo por MP.